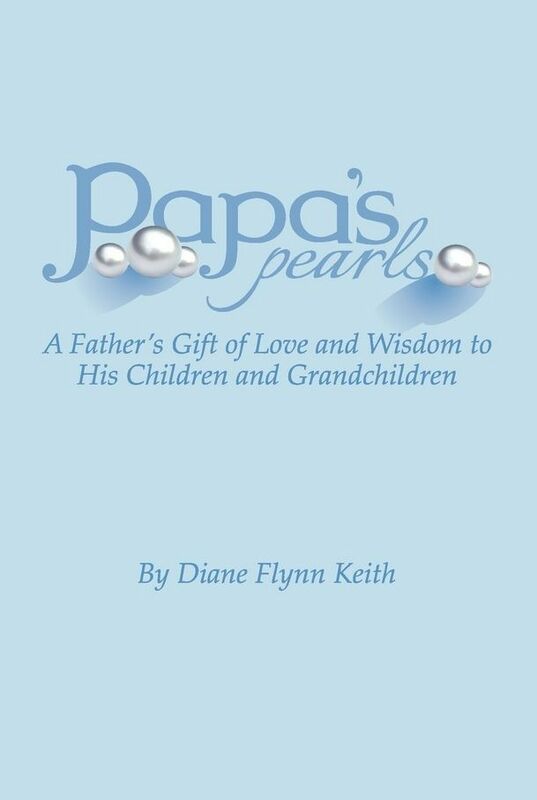 It's no secret that I love books, so when the opportunity came up to review Papa's Pearls: A Father's Gift of Love and Wisdom to his Children and Grandchildren by Diane Flynn Keith, I jumped on it. It sounded like a wonderful book - a glimpse into life during the Depression Era, as well as "pearls" of parenting wisdom to share from Diane's Papa, Carol Flynn. Dianne, in addition to being Papa's daughter, is an alternative education specialist, parenting coach, and author of a nifty-sounding book called Carschooling: Over 350 Games & Activities To Turn Travel Time Into Learning Time. Check out her other website, Homefires. I was not disappointed. I loved reading this book, laughed a lot, and even cried during parts. I treasured reading it with my children, because it inspired some wonderful discussions. It's written to parents, intended to help you pass on some solid, practical knowledge to your children. It's well written, very much what I would consider a "living" book on parenting, and a quick read. I think it's within easy grasp of middle school students, but I would say it's best shared as a read-aloud, so you can discuss things as you go along. There is nothing horrible, but there are some situations you'd want to talk about when they come up in the book. Diane's Papa, Carol Flynn, grew up in a family where illegal activity was accepted as the norm. When he was a teenager, he was sent to reform school. While he was there, he learned useful trade skills, and more importantly, came under the influence of a great mentor: his teacher, Mr. Brammer. Instead of letting the experience send him further down a path defined by bad choices, he used it to turn his life around, and became a true example of the American Dream - a man who made a success of himself through hard work and perseverance, and lived by the Golden Rule. Each chapter of the book shares one or more of Papa's bits of timeless wisdom, along with sweet memories of Papa from his children and grandchildren. He taught his children to be independent and responsible, and gave them plenty of opportunity to develop their "street smarts" - to learn common sense and how to handle themselves in just about any situation. He also gave them a strong foundation of love and the confidence that comes from knowing your parents are always on your side. That didn't mean they didn't suffer consequences for making bad choices - they did - but Papa always made it a learning experience. For example, when he caught his son smoking with his friends near their gas meter, he didn't yell - simply asked his son, "What were you thinking?" and then told him if he was old enough to smoke, he was old enough to work, and had his son come to work with him in his plumbing business every day after school when he didn't have another activity planned. Not only did this keep the boy from having too much free time to indulge questionable choices, he learned a lot about plumbing, how to manage his time well, and to follow through on a job. "When you fall down, get back up, brush yourself off, and try again." "Ya gotta do what ya gotta do." "Let it go, like water off a duck's back." The look they would get on their faces when they heard someone else saying things they hear often from their dad and me was priceless! I wish I'd been taking pictures. I also felt challenged to be a better parent. Papa was not prone to lose his temper; no one talked about him yelling. I tend to yell; I can do better. Papa was also an intentional person and parent. He did the best he could do in every situation. Also, he was kind. He put his family first, but was always willing to offer a helping hand to someone in need. One of my favorite stories in the book is about a toothless, unkempt man named Andy who lived in a shack next door to Papa's plumbing business. Papa gave him a job, and introduced him to anyone who came to the shop. He honored the dignity of a man that many people, then and now, would probably prefer to ignore. My favorite was chapter 10, when Dianne told how Papa always put his family first, and would tell anyone how proud of them he was. One precious memory from his granddaughter, Katie, was his telling her that he would say hello to her photo every day. Papa had a way of letting his family know just how important they were to him. That was the part that moved me to tears. I had grandparents who loved me like that, and I treasure their memories. I hope to leave a legacy of love like that for my children and, Lord willing, my grandchildren. I hope you will take the opportunity to read this book. It's available for $14.97 plus shipping and handling from the Papa's Pearls website. Hi Beth! Thank you so much for your heartfelt review of "Papa's Pearls." Your review made me a little teary - and I wrote the book! LOL!